Taken in the 1920s. A man is just entering the Seven Stars and talking to a woman in the pub who is wearing a hat. His car is outside and has a fold-out front windscreen for ventilation and a seated lion radiator cap. 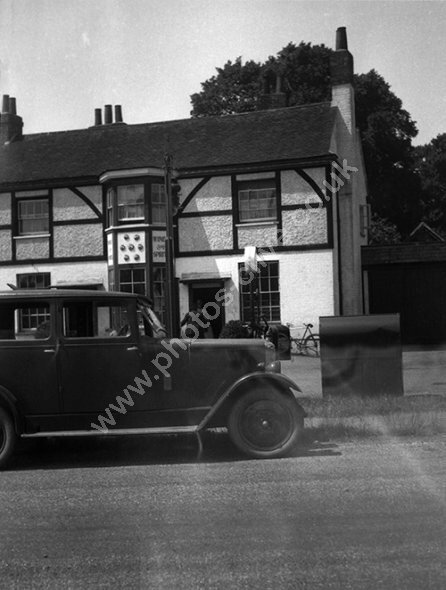 He has probably stopped for petrol as there is a tank and pump in the picture for Pratt's High Test petrol. The pub closed in February 2012 and is a listed building being a seventeenth century coaching Inn. For commercial use of this photo, including use on another website, please visit Alamy.com and search for M8JDP7. For a one-off print please see below.